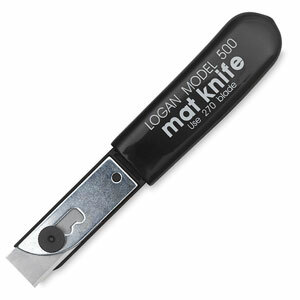 Logan's Model 500 Mat Knife is ideal for making straight cuts when cutting mat boards to size. It features three depth settings for a variety of mat board thicknesses: safety, single-sheet, and double-thick. The Model 500 Mat Knife is easy to use. Simply remove the knob, separate the blades, choose the appropriate hole, replace the knob, and use the knife against a straight edge to make clean cuts. The Model 500 includes three extra blades, and uses #270 replacement blades.